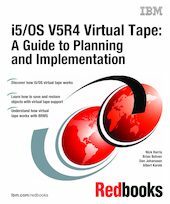 In this IBM Redbooks publication we provide a detailed explanation of the new virtual tape support provided by i5/OS V5R4. We cover the concepts, planning, and use of virtual tape support. Backup and Recovery Media Services (BRMS) is an important program product for System i5 customers to enable management of their system and data backups. This publication describes how BRMS uses the new virtual tape support for virtual backups. This book is intended for IBM, Business Partner and customer technical professionals who will be planning, implementing, and operating virtual tape support.